Two Department of Public Works employees prepare a new traffic light to hang over an intersection. 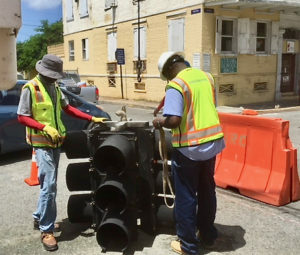 About 75 percent of the hurricane-damaged intersection equipment on St. Thomas and St. Croix that were still out of service in March have been restored and are now functional, according to Jomo McClean of the Department of Public Works. 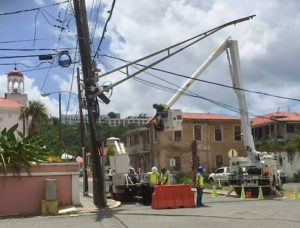 McClean said an estimated 59 intersections on St. Thomas and St. Croix were still in need of repair in March after being ravaged by Hurricanes Irma and Maria. Three quarters of those intersections, around 45, are now functional. McClean, the DPW engineer who manages the Federal Highway Administration Emergency Repair Program, said the two intersections on either side of the Vendor’s Plaza on the St. Thomas Waterfront will be operational in less than two weeks. The delay in the repair of these two intersections has prompted public concern from those anxious to see work completed faster. DPW plans to return all street lights up to standard, with new poles and signage, and also intends to upgrade the equipment. Aside from traffic lights, DPW initially prioritized all repairs to roadway damage by the 2017 hurricanes based on each road’s public usage. Areas with the highest public demand were addressed immediately, whereas others in less frequent demand are in the pipeline for repairs which haven’t begun yet. For instance, the public has seen work already completed on St. Thomas including reconstruction, paving and signage on the Brookman Road, the Wintberg Road and the retaining wall on the Crown Mountain Road. On St Croix DPW focused its immediate, post-storm efforts on the container port road and the Veteran’s Shore Drive in Frederiksted. The Turpentine Run Road project is another project also nearing completion. A DPW crew works on an intersection on St. Thomas. According to Public Works Commissioner Nelson M. Petty, Jr., fixing the structural issues resulting from the two September hurricanes has translated into millions of dollars in territorial road projects that still must be completed. More than 20 territorial projects are in various levels of consideration. These additional projects do not include work on St. Croix involving the Melvin Evan’s highway or the Sion Valley road and sidewalk construction. 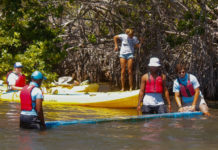 Adding to the incoming infrastructure projects in the Virgin Islands, are an additional $243 million in Community Development Block Grant- Disaster Recovery funds. This money will be used for a variety of disaster related recovery projects. “This will empower the DPW to address residential area road projects,” McClean said. Moving forward, DPW representatives said, quality and quantity of repair projects be completed in a thoughtfully and deliberately way. Proposed projects must have detailed scopes of work and must be verified regularly for compliance. Consideration must be paid to all federal and local testing requirements – for adherence to construction criterions as well as to ensure that the quality of building materials, (concrete, asphalt and other supplies) meet prescribed standards. “One project that St. Thomas residents will see work commence shortly is the Pilgrim Terrace By-Pass Road project. Bids were due the first week of August,” Petty said. Petty replied DPW still faces two major challenges: manpower limitations and public understanding. The second challenge is the publics’ understanding of what it takes to complete repairs, he continued. “For instance, normally, public roadways have an expected lifespan of about 15 years if they are constructed with all the correct requirements. One key element that determines a road’s ability to remain intact is the degree to which it is exposed to water damage. Immediately following Hurricane Irma, V.I.’s roads sustained only minor damage if any. For the most part, V.I.’s roads were in a good position to rebound from the rain water dumped by Hurricane Irma,” Petty said. Petty said that created an extraordinary situation for DPW and for the residents of the V.I. “Unfortunately, people may not have understood that no work could begin until the massive amounts of water had somewhere to go,” he said. Irma and Maria were extraordinary events and despite the tremendous resources, money and other support that came and continues to come from the federal government, it is taking time to get the territory back on track. The commissioner said he is tremendously grateful to the V.I. community for their understanding and patience as his department tackles one of its most challenging periods in history. He asked for continued public support and perseverance as he and his DPW staff rebuild the V.I.’s infrastructure. He also reminded the public that the V.I. is not the only place challenged by time delays. For instance, he noted that jurisdictions impacted by Hurricanes Sandy (Long Island, New York) and Katrina (New Orleans, Louisiana) are still working on recovery projects. On a side note, Petty said he wants the V.I. public to know the territory is actually realizing unexpected benefits.